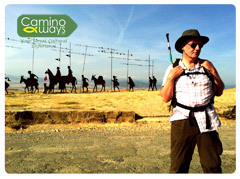 We are sponsoring TG4’s new documentary “Rónán ar an Camino” as it follows radio presenter & Gaoth Dobhair man Rónán Mac Aodha Bhuí (Raidió na Gaeltachta) as he walks part of the Camino de Santiago, an ancient religious pilgrimage in Northern Spain, on a personal journey and quest to find out what’s its attraction. Is it religious, spiritual or personal reasons that draw thousands of people to walk the Camino every year? 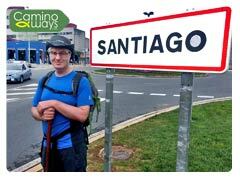 The Camino de Santiago is a famous pilgrimage to the Cathedral in Santiago de Compostela in Galicia. The pilgrimage has seen a revival of interest in recent times with movies such as The Way, a film about an American doctor, played by Martin Sheen, who completes the route in memory of his son, killed while walking the Camino. Starts on Thursday 21st February at 10pm and will be repeated on Sunday at 7.15pm on TG4. In each episode Rónán meets an eclectic mix of colourful characters each with their own story to tell all searching for a deeper meaning in their life. These include Cristiano who has walked 2000 miles from Rome, Wanda who’s loneliness drove her from Canada to walk the Camino, Joe from Japan who is walking the Camino with his two young sons after giving up his job to spend more time with his family, Deirdre from Lithuania who wants God to show her what path to take in her life, the Gilligans from Ireland who are celebrating 30 years of marriage and are walking the Camino de Santiago with their children to celebrate. 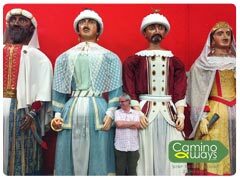 Rónán also stops off in Pamplona where he gets to sample some Basque music and culture. Throughout his walk Rónán explores his own personal quest for happiness making this a challenging journey, both emotionally and physically, marked by laughter, tears, new friends and lots of blisters! The series is shot on location in Northern Spain.